Well of course I didn't put the "Waterfront" stamp set away. You must know me by now!!! LOL So that means that I had to play with it again. I even left out all the ink pads too!! The card I made yesterday I had copied but today I winged it. Since I got a feel for the image pieces yesterday I felt I could give it a try and have some fun. And I did! The base of my card is a folded half-sheet of Always Artichoke. On top of that is a 4" x 5=1/4" piece of Soft Suede. And the focal piece is cut 3-3/4" x 5". First I stamped the mountains. I used Soft Suede and stamped the darkest one you see. Then I stamped the next darkest one without inking up the image again. 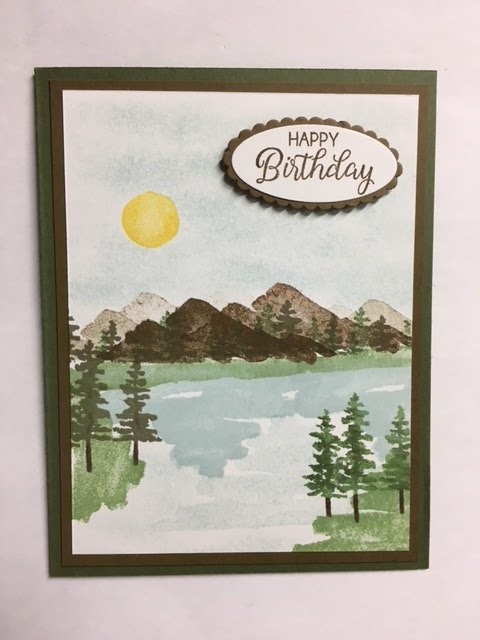 I also stamped the smaller mountain top to the right and I gave it one last little stamp between the mountain top on the right and the little bit darker one. Click on the photo and you can see that mountain way off in the distance. I did ink up once more but stamped off twice before I stamped the mountains on the left side. Next I took the tree image and inked it up with Garden Green ink. I took 2 post it notes and covered the bottom part under the mountains. I just wanted short trees here. I stamped my trees all across the mountains. Then I took the long strip image in the set and I stamped the green under the mountains. I used Wild Wasabi ink. Then I took the large scribble like image and inked it up with Soft Sky. I stamped just under the Wild Wasabi image. I moved it over and stamped another one, I wanted to cover a lot of area across the Wasabi line with it. I inked up the image one more time and this time I stamped off, I turned the image 180 degrees and stamped between the two darker Soft Sky images. I also stamped on the other side of the darker Soft Sky image. I didn't ink up my image again, I just used what was left on the stamp. It was light, but it's visible. I cleaned off that image and inked it up with Wild Wasabi and stamped it on the bottom corner area. I turned it 90 degrees, inked it up and stamped on the left side of the card. Next I inked up the trees image using Garden Green and I took my Always Artichoke marker and tapped on the green areas of the tree to give it a darker contrasting look. I used my Chocolate Chip marker on the tree trunks and I stamped it on the bottom right area of the card. I inked up the trees again using Always Artichoke and colored in the stems and added a few trunk lines up the tree. I stamped that to the left of the card. For the sun I stamped it using Daffodil Delight ink. I punched out 3 3/4" circles from the sticky part of a post it note and set them over the sun. I sponged in some Soft Sky ink. The words are from the "Beautiful Bouquet" set. I stamped them using Soft Suede ink. I die cut them and I die cut a Soft Suede scalloped oval for the layer. I set those in place using Dimensionals. And there you have it. A fun masculine card! Great job with this beautiful scene. You thought of everything to make it perfect. Have a great day! Love this card, Wanda! May I say I like it even better than your previous design. It looks so natural, that I wish I could be there in person. Thanks for sharing. Your scene is beautiful! My Waterfront set just arrived and I am looking for ideas. Your card caught my eye. Thank you for your clear directions! 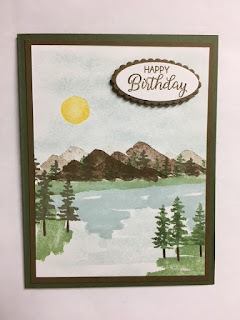 I am waiting to get my Waterfront stamp set and your lovely card is a real inspiration! Thank you for your clear directions. I am waiting to get my Waterfront stamp set and your card is a real inspiration!